Hi everyone! 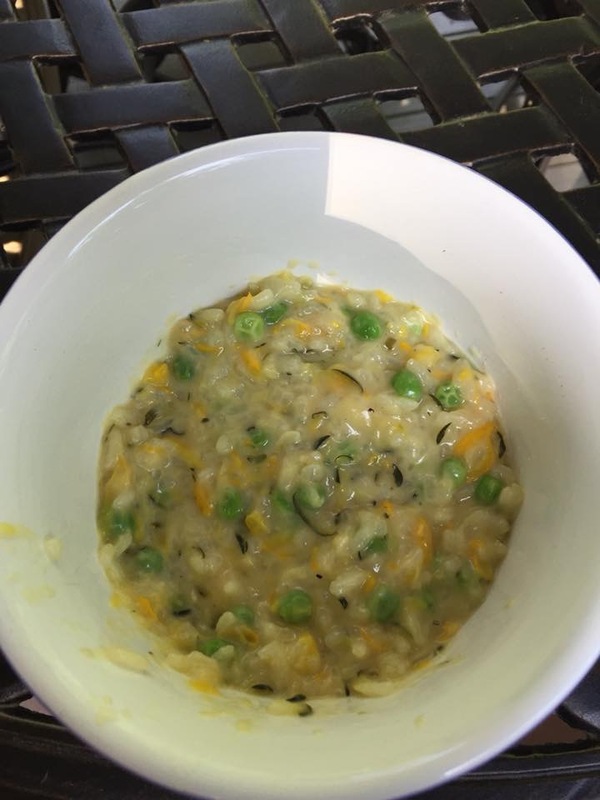 Jess here with another great recipe from fellow Springdellian Maryellen M. She started with a good basic risotto recipe and then worked in some summer veggies, including summer squash, zucchini and peas. You can tweak this risotto to add other veggies as desired. Prep the veggies by using a box grater to grate squash and zucchini, and par boil the peas. In a large heavy saucepan, heat the oil over medium heat. Add the onion and saute until softened, about 4 minutes. Add in your squash and zucchini and give a quick stir to help remove the excess liquid from the veggies. Add the rice and stir until each grain is well-coated with oil and translucent with a white dot in the center, about 3 minutes. Add the wine and stir until it’s completely absorbed. Add the simmering stock a ladleful at a time, stirring frequently after each addition. Wait until the stock is almost completely absorbed (but the rice is never dry on top) before adding the next ladleful, and add the peas just before the last ladleful goes in. Reserve 1/4 cup stock to add at the end. When the rice is almost tender to the bite but slightly firm in the center and looks creamy, after about 20 minutes, remover the heat and stir in butter to taste and the reserved 1/4 cup of stock. (Maryellen likes to stir in 1-2 cups of grated Parmesan cheese at this point.) Season to taste with salt and pepper and serve at once. Thanks for sharing, Maryellen! Another good one for the database!